This is the home of the Arizona Republic, the major newspaper for the Phoenix area. Behind it you see the tall Sheraton Hotel, one of the new tall buildings on the downtown Phoenix skyline. This terra cotta Art Deco building was built between 1928 and 1929 and sits in the heart of downtown Phoenix. Saturday night I attended an event called “Gourmet Theatre”, an annual fund raising event for Actor’s Theatre in Phoenix. It’s a very unique event where restaurants all over the city prepare a very special dinner for a table of 8. Participants meet at one location for the cocktail hour with some entertainment and a silent auction. Then they learn what restaurant they will be dining at and they head out for a gourmet feast. The restaurant I dined at is Durant’s, a well know, 55-year old landmark in mid-town Phoenix. Above you see the fourth course for this fabulous meal, pepper crusted filet of beef, wilted Swiss Chard, and lobster mashed potatoes topped with cognac cream. It was a delightful meal shared with good friends. A couple of comments on my site yesterday asked where I found that disco ball. Well, the answer is a little strange. I found it in this old trolley bus parked in a vacant lot behind a fast food restaurant. If you look closely, you’ll see it sitting in the driver’s seat. I think the party is over for this old trolley too! All that remains from the disco era. The chapel is no longer located in this building, but what really intrigued me was the sign that looks as though it’s been through some very rough times. I work in an office complex made up of several buildings and I only recently found this quiet little spot to take a break. This prickly pear cactus appears to have found a way to grow in the arms of a giant saguaro cactus. Very unusual. This lady was focused on a butterfly shot, when another butterfly hopped aboard to see how the photo was turning out. Two cactus wrens sitting on top of an agave bloom. 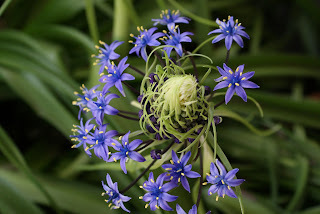 Special thanks to everyone who helped me identify the flower I posted yesterday! 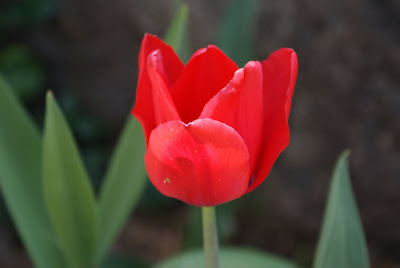 Yesterday, Brattcat asked if the tulip I pictured was in my garden. It wasn’t. It is in the garden of a dear friend but, the question made me think I should picture something that is in my garden. The problem is, I have no idea what kind of flower this is. A couple of years ago, my wonderful gardening neighbors gave me several pots to use to create an herb garden in my back yard. 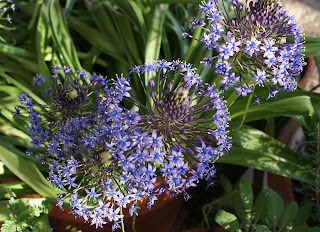 Neither of us knew that hidden deep in one of those pots were a couple of long forgotten bulbs that took hold and started to bloom when they got regular water. The first time they sprouted, it was nearly summer and quite warm so all I got was leaves. 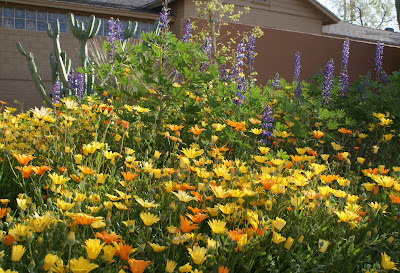 This year they sprouted early and produced several gorgeous blooms that seem to unwind on a daily basis. I took the top photo yesterday morning. The second photo was taken last weekend when it just started to bloom. 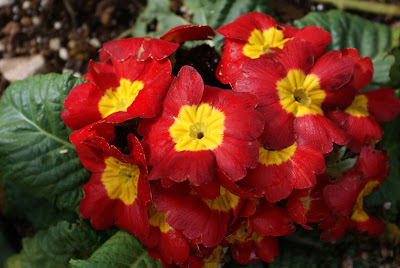 You can see how the little flowers seem to unwind from the bud as they open. For the third photo, I backed up a little so you could see several of the blooms. 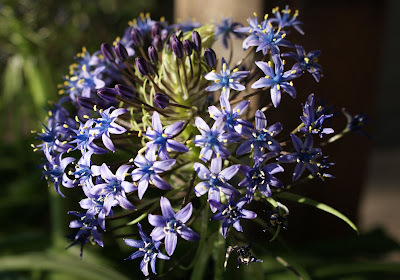 If anyone knows what flower this is, please let me know. My neighbors have that magic touch when it comes to gardening. This gorgeous combination of African daisies and lavender lupine is growing in their front yard. What a gorgeous combination. On Saturday I had an opportunity to look at some of the condos available at One Lexington, a high-rise building on Central Avenue that I pictured here. When I took that photo in 2008, the building was called Century Plaza. The owners at that time lost the building in the real estate downturn and it has since been purchased by a new group who changed the name and is completing construction on the condominium units. From what I saw, it’s going to be beautiful with fantastic views as you can see from this shot looking north (away from downtown) on Central Avenue. Have you ever wondered what the top of light rail cars look like? Me either! But, I must say I was surprised to see that they were open with all that equipment showing. It sort of reminds me of the space shuttle when those bay doors are open. I took this from the 13th floor of a building along the light rail line. 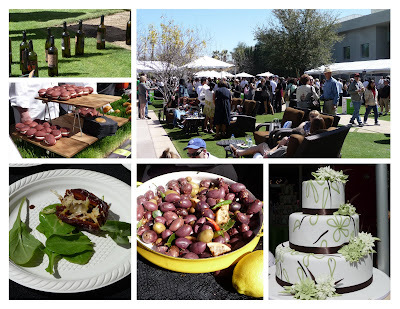 The courtyard of the Phoenix Art Museum was the setting for a gourmet event on Saturday and Sunday called Devoured. Many restaurants participated, showing off some of their best dishes. There were also quite a few wine distributors offering up sips of their vintner’s best. Some of the things I have pictured here are house made “moon pies”, chorizo stuffed dates, an assortment of imported olives, and a gorgeous celebration cake. Some things I tried, but didn’t photograph included a dessert composed of red and yellow beet custard topped with “pop rocks” and a liqueur. They called it “Rocking the Beet”. It was a beautiful day for a culinary feast. 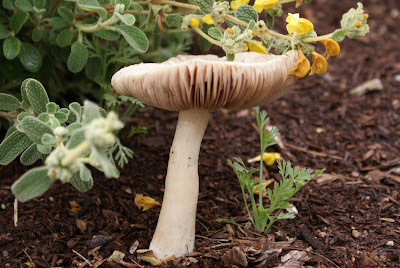 The rainy season in the desert produces mushrooms in the garden. When I was a young girl, my mother taught me about the correct color combinations. She told me to never wear red and yellow together because they clash. She would have been surprised by these flowers. 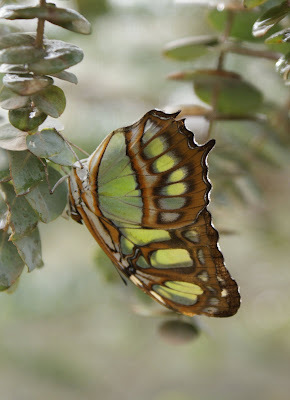 The butterflies are back at the Desert Botanical Garden. This is called a Malachite. It was a bit chilly and rainy the day I went so the butterflies were quiet and hiding from view. Butterflies don't like when the temperature dips below 60 degrees (16 c). Here is another photo from the “Arts and Flowers” exhibit at the Phoenix Art Museum. The museum has a section dedicated to fashion and the artistic fashion designers who have influenced fashion over the years. This floral design was made to mimic one of the outfits in the current exhibit of Geoffrey Beene designs. Very clever. Anther event I attended on Sunday was a home tour called Tour For Life. It is an annual event that benefits the Southwest Center for HIV/AIDS. The tour consists of 10 outstanding homes whose owners graciously open their doors to the many people who make a day of touring these beautiful residences. I took this photo from one of the homes looking north toward Scottsdale. You can easily see the heavy skies we experienced on Sunday. One homeowner had the right idea! The 52nd annual Indian Fair and Market took place over this past weekend at the Heard Museum. I went Sunday morning, in the rain and still enjoyed every minute of it. This man posed for a photo when I caught him doing a little repair work on this tented booth. He was probably trying to stop a leak. This was one of many beautiful things I saw at the fair. Phoenix is drenched! We’ve had a lot of rain lately, but I’m not complaining. We get so little of it that it’s been nice to see this series of storms roll through our valley. I took this photo on Sunday looking out at the patio at a friend’s house. March is one of the busiest months in Phoenix with events going on all over town. I think March gets chosen because historically it is one of the best perfect weather months in the nation. One of the events going on this last weekend was the "Arts and Flowers" event at the Phoenix Art Museum. This event is where floral designers create floral arrangements to match artwork on display at the art museum. I did a feature on this same event last year and it was back again this year with more flower arrangements than before. The one I've picture above is so good, it's hard to separate the flowers from the real painting. 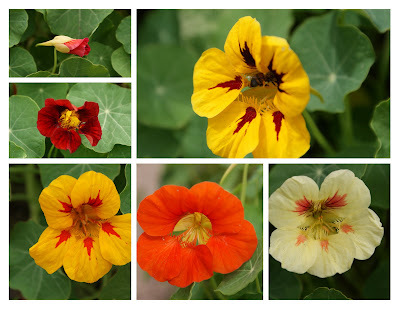 Nasturtium, the edible flower blooming here in a variety of colors. Here is another Allan Houser sculpture on display at the Desert Botanical Garden. This one is named “When Friends Meet”. This one has been a challenge to photograph because its back is facing southwest, right where the sun is always sitting. I took this shot on a cloudy day. There is a new restaurant in downtown Phoenix called Sens. It’s a casual small space that serves Asian style tapas. Small plates of exotic Asian specialties make up the menu and satisfy the taste buds. I’ve eaten there twice and enjoyed it both times. I think the spicy wontons and the papaya mango spring rolls might be my favorites, but there is always something new to try at each visit. The blue lights along the bar are an interesting touch, but I really like the lotus blossom light fixtures. There was a bit of police activity at my local grocery store the other day. I never heard what caused such a turn out of police cars. 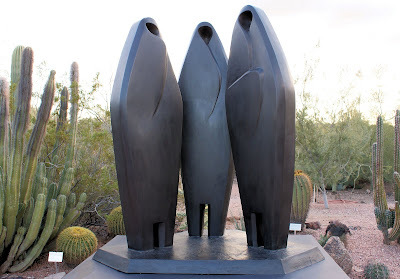 I spotted these tourists about to be attacked by the “Spirit of the Mountain” sculpture at the Desert Botanical Garden. At least that’s how it looked from my vantage point. Yesterday’s theme day photo is a bit deceiving since I took it on a bright, sunny Phoenix day. This last weekend was nothing like that. It rained almost the whole weekend. 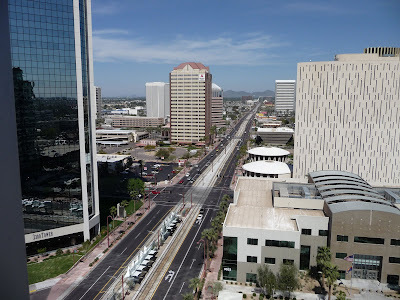 On Sunday, I met friends for lunch in downtown Phoenix so I took the light rail downtown and I learned something. Our light rail stations were not designed to protect you from rain. They provide shade, yes, but rain was not something the designers were worried about. I did manage to take a few rain-soaked photos from the window once I was on board. The passageway at the Esplanade Office and Shopping complex is complemented by these stylized frames. The design is a theme that is seen throughout the complex.